Lausanne is probably not the number one destination of choice for tourists visiting Switzerland, being overshadowed by the three main cities, Zurich, Geneva and Bern. However, as I found out recently, a short trip to this picturesque lakeside city is definitely worth the effort. Lausanne sits on the shores of Lac Leman (Lake Geneva) and is split between the old town situated on the hill and the lakeside resort of Ouchy-Olympique. With my love of lakes and mountains, it is the waterfront area that we chose to stay in. After a few city breaks packed full of sightseeing, we’d decided that this would be a great antidote, an ideal way to slow down a bit and unwind, whilst still experiencing a new destination. An added bonus was the fact that we knew that Le Musee Olympique was located on the lakeshore. 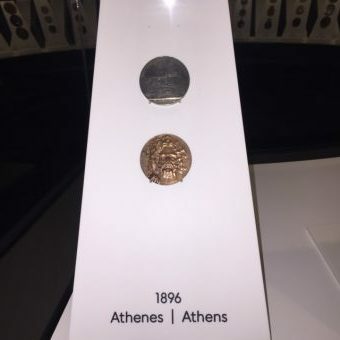 After a summer of avidly watching the Rio Olympics, it was a museum that we were really keen to explore. 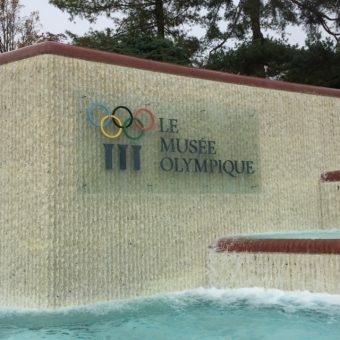 Le Musee Olympique is a reminder of the role Lausanne plays in housing the headquarters of the Official Olympic Committee, and is set in a stunning location overlooking the lake. It’s a must for visitors, even if you don’t regard yourself as a fan of the Games or having any sporting prowess (i.e. me!). Laid out over three floors, the museum traces the history of the ancient Games up to the modern day in painstaking detail; this includes a fascinating account of how the modern Games were resurrected in 1896 by its founding father, Pierre de Coubertin, and how his vision created the foundations for the Games we know today. Packed full of little known facts about the Summer and Winter Olympic Games, and Paralympics, we also read about some of the less publicised stories behind the Games and the political intrigue associated with them (e.g. the first time women were permitted to take part in 1900, the boycotting of various Games throughout the 20th century, and the entry of a united German team in 1956). The level of detail is mindboggling. We read about the history and design of the Olympic villages and stadiums, as well as the importance of volunteers in staging the Games. This was something that I knew had been indispensable to the success of London 2012, but I hadn’t realised that volunteering had always been such an integral part of staging the games. 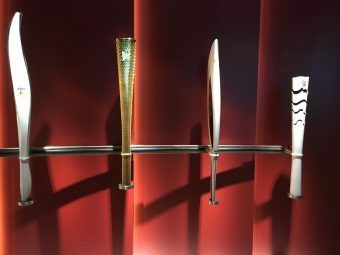 The museum exhibits were impressive: I was struck by the display that showed how the look and feel of the Olympic torch had changed over the years and the varied designs for the medals awarded in successive Games (which have progressively got bigger over time and that I had – incorrectly – assumed would retain the same design from Olympic Games to Olympic Games). The museum has been designed to appeal to both adults and children. There is a wealth of archive video footage that you can delve into which covers opening ceremonies and reflections from famous Olympians, organised into past decades. It is also an extremely interactive and educational museum: on one floor, you can test your eye-hand co-ordination by smashing lights that the appear across a body length board with your hand against a countdown clock (I managed 34 successful hits in 2 minutes; the highest score ever recorded is 172 hits in 1 minute!). You can also assess how effective your balance is in scoring a goal in a football match (mine wasn’t great…. ), and get feedback on how good your diet is. Then, when you want to rest your feet and have a refreshment, there’s an excellent café on the top floor with jaw-dropping panoramic views of the lake and mountains where you can sit and ponder the inspirational stories and feats you’ve just read about. The delicious bar snacks are the icing on the cake. We were only in Lausanne for one night but it was a perfect weekend break for us, combining some chill out time with the opportunity to lap up some inspiration. It might not beat Zurich or Bern for sheer chocolate-box character, but in the words of the founder of the modern-day Olympics, “The important thing in life is not the triumph, but the fight; the essential thing is not to have won, but to have fought well” (Pierre de Coubertin). Lausanne scores perfects tens for all of this. Entry to Le Musee Olympique is 18 Swiss Francs. Other activities: Aside from the opportunity for lovely lakeside walks, you can also jump on one of the many ferries that link Ouchy with other parts of the lake, such as Montreux, and Evian-les-Bains and Thonon-les-Bains in France. Most roundtrips can be completed in a matter of hours. The Old Town: To get to the old town from the train station, you can either take the Metro (two stops) or walk (beware, however, if you choose to walk, it’s an extremely steep 10-minute climb uphill from the station). The centre has an undeniable charm – narrow, cobbled streets and medieval squares, with the skyline dominated by the Chateau Saint-Marie. There are some quaint and cosy cafes and restaurants dotted along these streets and when we were there, there were street stalls cooking fresh chestnuts and selling hot chocolate. Getting here: For short breaks, the closest airport is Geneva – you can then reach Lausanne by either train or car in less than an hour. Other possibilities, if you have more time, is to go into either Zurich and Lyon airport (or Lyon Eurostar terminal), which are 2 to 3 hours away by car or train. 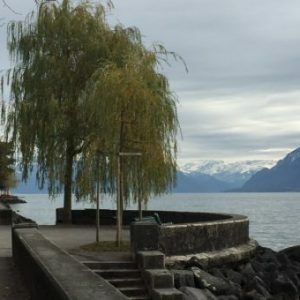 Lausanne to Ouchy by Metro is around 10 minutes (once you’ve checked into your hotel, you can obtain a city pass which provides free rides on public transport). Accommodation: There are several exclusive hotels in Ouchy, but for more reasonable rates and a comfortable stay, we stayed at the Hotel du Port. 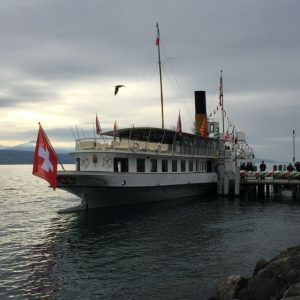 It has a downstairs bar and restaurant and next door, the small restaurant Le Vieil Ouchy serves traditional Swiss food – it has seating outside for summer days, but its lovely cosy interior make it perfect for cold winter evenings. Eating and drinking: There are only a handful of other restaurants here in Ouchy, (one in the converted old castle and another in the hotel where Lord Byron once stayed and from where he wrote the poem “The Prisoner of Chillon”), but most serve the traditional Swiss fare that we often associate with the country, including sausages with mustard, potato rosti and fondu, and some delicious Swiss wines.